Recently Blue Cure Foundation President Gabe Canales joined Whole Foods Market co-CEO John Mackey and honorary co-chair Carolyn Farb to welcome more than 300 guests to Houston’s Omni Ballroom for a night of entertainment and exquisite dining, all in the name of healthy lifestyles and cancer prevention. How wonderful is that? The décor was earthy yet ethereal, with gold linens topped with massive blue hydrangeas in art glass vases created by Bill Meeks. It was an evening to remember, featuring a rousing live auction, sumptuous dinner and inspiring presentations by the charismatic hosts. Dominique Sachse, the lovely and talented anchor of Channel 2 KPRC, served as the Mistress of Ceremonies until she was called away to anchor the evening news. Stephen Lewis of Bernstein Global Wealth Management took over as emcee, while guests who wore their dancing shoes grooved to the global beat by Moodafaruka. While partygoers perused the silent auction, the Honorable Judge Eric Andell presided over the big board proceedings, which raised the audience to an animated crowd. Dinner was prepared in the spirit of the Whole Foods Diet philosophy, which encourages healthy lifestyle choices while enjoying delectable gourmet cuisine. 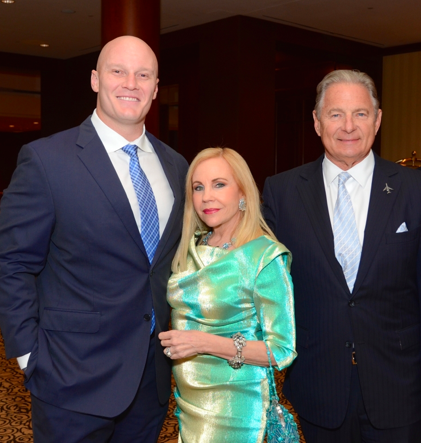 The Fred and Mabel R. Parks Foundation was the presenting sponsor of the evening, along with honorary co-chairs Chris Myers – a former Texan and two-time pro bowler – and Dr. Carolyn Farb, a driving force behind Blue Cure who leads much of the athletic initiative to promote healthy lifestyle choices, and a mentor to Blue Cure founder Gabe Canales. Whole Foods and Blue Cure came together with a mutual goal of saving lives by promoting a healthy diet and lifestyle. Blue Cure’s mission is to advocate for cancer research funding and to encourage preventative dietary and lifestyle habits before cancer strikes. Whole Foods wholeheartedly agrees, as co-founder John Mackey detailed in his riveting presentation on the Whole Foods Diet philosophy, which kept the audience captivated and ended with a standing ovation from the crowd. By the end of the night, the event raised nearly $400,000 for Blue Cure’s initiatives.